Members of Patterson Scout Troop 440 greet a customer donating needed food products for the Patterson Community Church Food Pantry last Saturday outside Kobacker’s Market in Brewster. Photo By Eric GrossThe Patterson Community Church Food Pantry has … Please login below or purchase a subscription to the Putnam County Courier to access this content. For the second time in less than six weeks, a Brewster school student has posted a threat on social media that caused concern and consternation throughout the district. On Saturday, a parent contacted Henry Wells Middle School Principal John Clark ad… Please login below or purchase a subscription to the Putnam County Courier to access this content. 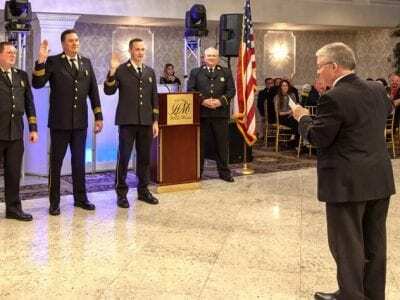 Mahopac FD Chiefs Bill Nikisher, Jason Kinash and Andrew Roberto are administered their oaths of office by Putnam County Judge James Reitz. Photos By Tom BeattyThere was a festive mood at the Villa Barone in Mahopac on Jan. 26 when more than 250 gues… Please login below or purchase a subscription to the Putnam County Courier to access this content. Assemblyman Kevin Byrne has opened a new district office in Southeast. Located on the second floor at Three Starr Ridge Road, Byrne and his staff are available daily to answer questions and concerns posed by residents of his 94th Assembly District. … Please login below or purchase a subscription to the Putnam County Courier to access this content. 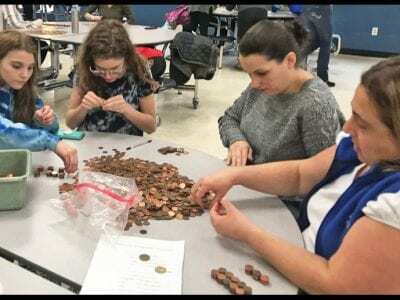 Photo By Laura Lee Holmbo Mahopac Middle School children partake in the “Penny War” to raise money for charity.Mahopac Middle School students went to war last month and raised $3,382 for the JennaJackPack organization. The ‘penny war’ was organized b… Please login below or purchase a subscription to the Putnam County Courier to access this content.